For Jane Kariuki, TRIO programs mapped out her college plan. "Talent Search really pushed me to consider the possibility of higher education. Then, since TRIO had already helped me so much in high school, I looked for a college that also had strong TRIO support programs," said Kariuki. "That led me to St. Scholastica. I was also impressed by how the College lives out its commitment to social justice in all areas. That was important to me because after college, I want to work for a nonprofit organization to help women and children in Kenya." 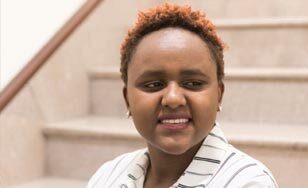 Kariuki applied to Student Support Services and was matched with a TRIO counselor who mapped out a four-year academic plan for her and helped her choose her major, Peace and Justice Studies. "I can't even put into words how excellent the TRIO program has been for me," said Kariuki. "My counselor, Melissa (Doreus), is the person I go to with any struggles I'm having. I'm only a sophomore and she's already helping me think about what I might want to do after college. She's talked to me about the Peace Corps and I'm quite interested in that. "I was a little apprehensive about coming to a private college in a predominantly white community, but I've found everyone to be very accepting and open," she said. "The Sisters (of St. Scholastica Monastery) promote the idea that we are all one, regardless of your background, religion or who you are. That has meant so much to me." Tayler Boelk grew up in Duluth and always dreamed of attending St. Scholastica. She and her dad used to ride their bikes on campus when she was a little girl and stop at the pond near the entrance to the hiking trails. "We'd marvel at the beauty of the campus and joke that the pond must be the fountain of youth because the Sisters all looked so young," she said. Boelk's parents never attended college, but they highly valued education and pushed her to do her best. Their efforts paid dividends when her grades made her eligible for many scholarship opportunities. St. Scholastica offered her a particularly generous financial aid and scholarship package, making her dream of attending the College a reality. "My mom went to a session for parents during freshman orientation and heard about TRIO's Student Support Services program," she said. "I decided to apply and it was one of the best things I ever did. 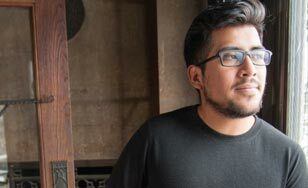 It turned out to be a huge part of my undergraduate experience." Boelk took full advantage of the tutoring, mentoring and workshops the program offered. 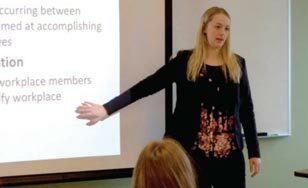 The most profound impact on her future came from a Career Ready Internship program, which allowed her to intern with the Duluth Library Foundation and receive a stipend. "I was a Biology major with an English minor at that time," she said, "but I found out I liked the work I got to do with the library better than what I was doing in my biology classes." She switched her major to English and minored in Biology. Boelk's Student Support Services advisor encouraged her to apply for the McNair Scholars Program during her junior year, which proved to be another pivotal moment. As a result of the encouragement and undergraduate research opportunities she gained through McNair, Boelk decided to pursue her master's degree after graduation. "The guidance I received from my McNair advisor was immense in helping me choose my graduate program," she said. Today, she is in the Master of Communication program at Western Michigan University, where she also works as a graduate assistant. While she isn't sure exactly where she'll go after graduate school, one thing is certain — the future is very bright for Tayler Boelk. "A big part of the Benedictine value of hospitality is creating an environment where all feel welcomed and TRIO plays a big role in that," said Dory Kempf '99, TRIO Program Director. "Our job is to go above and beyond to help students succeed and eliminate road blocks. I'm immensely proud of how St. Scholastica supports its students through TRIO."